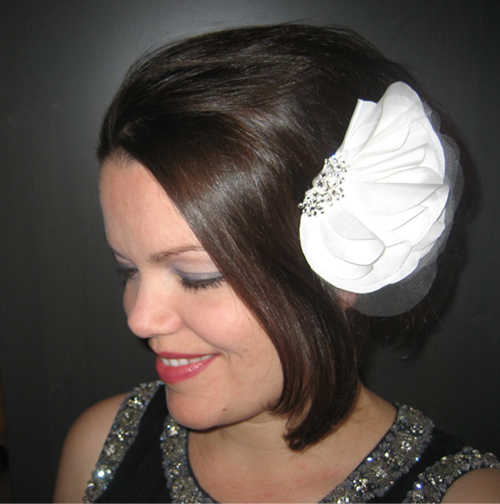 We have a new pretty in our Flowers and Feathers line… the Material Girl Silk and Flower Comb. 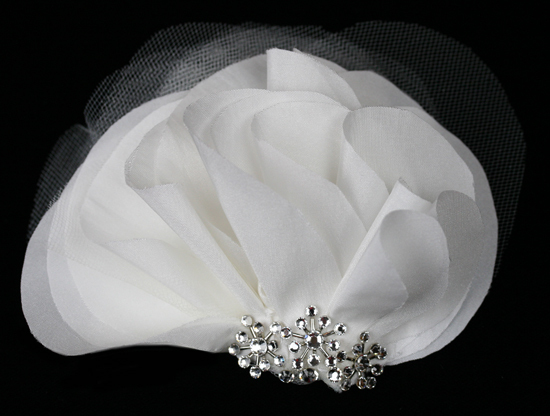 She’s a little sparkly, a little softly outlined with tulle, and just a little bit Art Deco inspired. Wear her anyway you like… pinned above the ear, tucked in the side of a chignon, or request an attached brooch pin and pin to a gown. I love this new piece! It’s shown in diamond white silk taffeta, however, one of my favorite new things to do is hand dye fabric, so if you’re looking for ivory let us know. Oh, and the simply gorgeous navy shirt with the jeweled collar is really vintage J.Crew… I’m thinking maybe it’s from almost a decade ago. Good things stick around, eh?